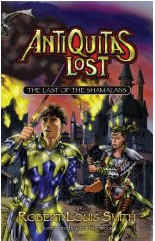 Antiquitas Lost: The Last of the Shamalans, is a book I didnt want to put down, yet it had some stylistic choices that didnt sit well with me. The book tells the story of 15-year-old Elliott, a lonely New Orleans boy who stumbles through a door in his grandfathers basement into Pangrelor, a world populated by a wide variety of races at the brink of war with each other. Upon arrival, Elliott is quickly befriended by two gimlets, a diminutive race of people who believe he is a shamalan, the race of people who once ruled the world, but who now had been murdered almost into extinction. Until Elliotts arrival, only one shamalan was thought to be left alive, the Princess Sarintha, who had been captured by the serpans, a race of aggressive people who were at war with the shamalans, gimlets, and grayfarers, large flying gargoyle-like people. With the princess captured, the ruling council of grayfarers, instead of welcoming Elliott, sent him to be tested by putting him into a pit which filled with water. Elliott didnt drown, but transformed into a water-breathing creature, thereby proving that he was in fact a lost shamalan by birth. The council, led by the grayfarer warrior Waldemariam, refused to acknowledge Elliotts status and slated him for execution, but he escaped, and with Jingo and Marvus, the two gimlets who found him, and Hooks, a Bigfoot-like susquatanians who had been sentenced to death until Jingo and Marvus released him, they took off to find another lost shamalan to try and head off the coming attack on the capital city. Along the way, Elliott is faced with the discovery that he is not really just a boy from earth, but he has powers he could never imagine, and he has a vital role in the upcoming conflict. The book has some rather good aspects. This world is not populated by the standard fantasy fare. Instead of elves, dwarves, ogres, and the like, the peoples of this world come from a different universe. And while some of them are recognizable, such as the susquatanians and maybe the grayfarers, others are not. The wildlife seems to be mostly Pleistocene in origin, although jarringly, the serpans ride dinosaurs. Regardless, the cast of characters are not the from usual Tolkienesque pool. The story line is well-thought out and fleshed. Intrigue, betrayal, and danger abound. At first I was bothered by the actions of Waldemariam as being unreasonable, but the author had a passable explanation for that by books end. I also like that the serpans, while they acted violent and without morals, were not totally evil. They had a real motivation to attack. It was easy to put yourself into their position and understand wy they were doing what they were doing. One very clever but minor piece of imagination concerned the susquatanaians. For such large creatures, they could hide very well in the forest. This was due to their ability to piloerect, that is, blend in with any tree, almost becoming one with the tree. This could explain how bigfeet in our world are so hard to see. I read the final half of the book in one sitting, so that is a pretty good indication on how well it caught my attention. However, the book is not without flaws. There were some factual-type problems. An example of this would be that when the party was in a small boat drifting down a river and were attacked by crossbow-armed serpans on the riverbank, the serpans were unable to hit any of them while the party was able to kill two serpans by throwing knives and two by slinging coins at them. Another time, the princess, while surrounded at close quarters by serpans with swords, was thrown a sling with which she was able to fight her way free. These are fairly minor issues though. I had more of a problem with the serpan Slipher, a small, young serpan who ends up as a captive of Elliotts party. His character was just too unbelievable, and he vacillated too much from one personality to the next. I also might be in a minority here, but I didnt like the illustrations by Geof Isherwood. I fully understand Isherwoods accomplishments in the field of art. However, I didnt like his portrayal of armor for example, as being pretty unrealistic. I didnt like mistakes such as when the narrative described all the members of the party holding a stone, in the illustration, only two held it while the rest clasped arms in back of them. But most of all, I didnt like the antagonist races. It seems that Isherwoods method to delineate the good guys from the bad guys was to draw the bad guys with their mouths wide open displaying a jaw full of sharp fangs. Of the many, many drawings of serpans and other allied bad guys, only one serpan was drawn with his mouth closed. With all due respect for his entire body of work, which I actually like, it seemed to me that he might have just mailed this effort in. My other major problem is with the style in which Smith writes. With such a refreshing cast of characters, Smith seems to embraced an older, more stylistic writing style and word choice which might have been more suited for 100 years ago. The rhythm of the book was hard to grasp with jarring word choices and syntax breaking the flow. However, either the cadence improved or I was just more caught up in the book as it move along as I was bothered by this less and less the closer to the end of the book I got. My overall impression with the book is positive. I enjoyed reading it, and that is the bottom line. It could have been better, in my opinion, but I would still recommend it for a good read. For more reviews or to buy Antiquitas Lost from Amazon.com, click here.